The Model 299 was the prototype of the B-17, probably the most significant air weapon of its time. In 1934, when the Army first announced its competition for a "multiengine" bomber to replace the aging B-10, Boeing engineers went to work to give shape to the design that would become the most recognizable bomber ever produced. 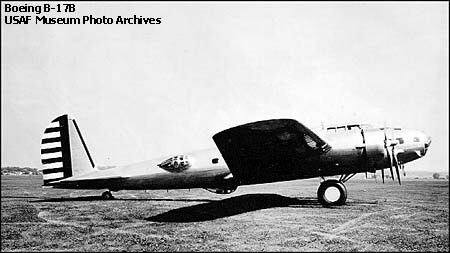 The Model 299 was a mid-wing monoplane of aluminum construction, powered by Pratt & Whitney R-1690 Hornet single-row nine-cylinder radial engines that could each produce 750 horsepower. The pilot and copilot sat side-by-side, each within reach of a clever new central throttle arrangement that allowed them to control all four engines with one hand. There was a bomb bay behind the cockpit, with twin vertical bomb racks accommodating up to 2,177 kilograms (4,800 pounds) of bombs. The nose was glassed-in to give the bombardier a good view. There was a nock under the nose where the bombsight was placed, as well as a bubble on top of the nose glass where a machine gun could be mounted. There was a flight engineer / radioman position behind the bomb bay, connected to the cockpit by a narrow catwalk through the bomb bay. 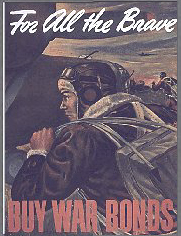 There was a machine-gun blister above the radioman's position, with a tub on the belly a little further to the rear for another machine gun, and then twin blisters on either side of the fuselage, to be each fitted with a single machine gun. Either 7.62 or 12.7 millimeter (0.30 or 0.50 caliber) Browning machine guns could be mounted, giving the Model 299 defensive armament of five machine guns. The project was financed entirely with company funds and was publicly rolled out at Boeing field in Seattle on 17 July 1935. The new aircraft was big and impressive, inspiring reporter Richard Williams of the Seattle Daily Times to call it a "flying fortress". Boeing public relations men liked the name so much that they adopted it and registered it as the aircraft's official name. On a proving flight from Seattle to Wright Field in Dayton, Ohio, for the Army tests, the 299 averaged 252 mph, setting a nonstop record for the distance. Although the airplane later was destroyed when an Army pilot took off with the controls locked, the Army was sufficiently impressed in the potential of this new bomber to place a service order for thirteen. It was then that the bomber received its designation, YB-17. The first of 13 Y1B-17's was delivered to the Air Corps in January 1937, with the last of the 13 were delivered that August. 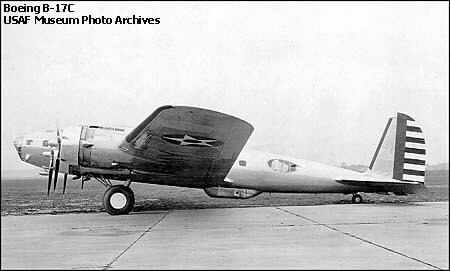 The Y1B-17 looked very much like the Model 299 prototype, but there were significant differences. The most important change was a switch from Pratt & Whitney Hornet engines to Wright R-1820 Cyclone engines. The Cyclone was also a nine-cylinder single-row radial engine, but had greater growth potential than the Hornet. The R-1820-39 Cyclone provided 950 horsepower for take-off, in comparison to the 750 provided by the Hornet. While the fourteenth YB-17 was only built for static test, it was upgraded to flight status and its engines were fitted with exhaust-driven turbosuperchargers. This aircraft was designated the "YB-17A". 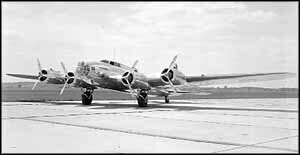 The turbosuperchargers proved troublesome, and although the Y1B-17A was scheduled to fly in late 1937, it did not actually take to the air until April 1938. Flight tests proved troublesome as well. The turbosuperchargers were mounted above the engine nacelles, and their exhaust disrupted the airflow over the wing, leading to vibration. Quick fixes didn't work, and Boeing engineers decided to relocate the turbosuperchargers to the bottom of the nacelles. 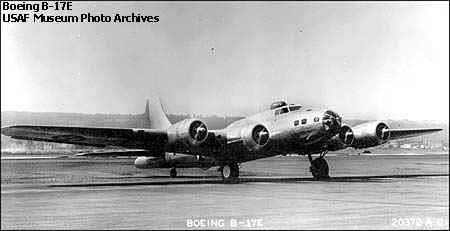 The Air Corps signed a contract with Boeing in late 1937 for ten improved Fortresses with turbosuperchargers, to be designated "B-17B", and orders for 29 more B-17Bs followed. 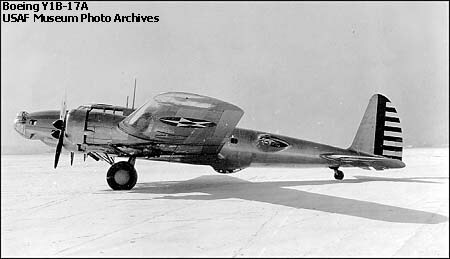 The first flight of the B-17B was on 27 June 1939, with deliveries of the 39 aircraft beginning in July 1939 and ending in March 1940. These aircraft were used to equip two bombardment groups, one on the Atlantic coast and one on the Pacific coast, making the B-17B the first Fortress to equip operational Air Corps units. The most visible differences from the YB-17A were a larger vertical tailplane, plus a new nose that eliminated the gunner's bubble and had a flat panel for the bombsight, which was moved forward, and a socket in the Plexiglas that could accommodate a 7.62 millimeter machine gun. The navigator's position was moved from behind the pilots to the nose, where he would have better visibility. The B-17B was also fitted with the top-secret Norden bombsight. Even before the first flight of the B-17B, the Air Corps had requested a still better Fortress, and in September 1939 ordered 38 "B-17Cs". The B-17C emphasized improvements in combat survivability. The teardrop gun blisters on the sides of the fuselage were replaced by flush-mounted windows. The blisters had limited the vertical gun traverse severely, while contributing to drag and interfering with airflow over the horizontal tailplane. The new windows were left teardrop-shaped to avoid major redesign of the rear fuselage. The dorsal blister was also removed and replace with a flush sliding transparency. The ventral blister was replaced with a "tub", somewhat like that on the German Heinkel 111, where the gunner could kneel and direct fire below and to the rear. Two additional socket holes were added in the nose to give the crew some flexibility in mounting the single 7.62 millimeter nose gun. Armor protection was added, along with a shared crew oxygen system and an improved fuel-distribution scheme. The changes resulted in a significant increase in maximum weight, but the B-17C was also fitted with uprated Wright R-1820-65 Cyclone engines. The new engines could provide 1,200 horsepower at altitude, increasing the speed of the B-17 to 520 KPH at 7,620 meters (323 MPH at 25,000 feet). The first B-17C flew on 21 July 1940, and went into Air Corps service in August. The last of the 38 were delivered by the end of 1940. The Air Corps wanted 42 more B-17Cs, but as the new batch materialized, it featured enough changes to be given the new designation of "B-17D". This aircraft looked very much like a B-17C, but provided two 12.7 millimeter guns each in the upper and lower gun positions, as well as improved armor and a large number of minor internal changes. The B-17Ds were delivered from February through April 1941. Some of the B-17Cs were updated to B-17D specification. In September of 1941, a new Fortress appeared. The Boeing B-17E was an extensively modified and improved version of the basic B-17D design. The most obvious change was the redesigned tail with its distinctive vertical stabilizer and fairing. A tail gunner was added because combat experience showed the earlier models extremely vulnerable to attack from directly aft. The waist gunner windows were changed from teardrop to larger rectangular shaped windows. The ventral 'bathtub' turret of the D model was initially replaced by a Bendix remote-controlled and remote-sighted belly turret. The Bendix turret was replaced by a Sperry ball turret starting with the 113th B-17E built. A Bendix turret was also added to the top forward fuselage just behind the cockpit. The B-17E was lengthened to 73 feet 10 inches to accommodate the new defensive tail position. Top speed was 317 mph, cruising at over 200 mph with 4,000 pounds of bombs. A total of 512 B-17Es were built by Boeing in 1941 and 1942.